I lived in Los Angeles for several years and love the historic downtown neighborhoods that most tourists miss. Chinatown is one of them. It is smaller and gets fewer visitors than it’s counterpart in San Francisco, but I think it is much more interesting, and a good starting point for travelers who love art, design and urban history. The neighborhood is not the original location of the Chinese neighborhood but was relocated to the area after the original was razed in the 1930s for construction of Union Station. There are a few requisite tourist shops, but also many Chinese and Taiwanese-oriented local markets and nonprofit organizations, catering to the numerous elderly Chinese residents who still live there–though many have moved out to the Asian suburban enclaves of Monterey Park, Rosemead and San Gabriel (definitely worth a visit for a taste of modern Chinese-American life in California)! The Chinatown area and surrounding neighborhoods are currently home to many Central American and Armenians immigrants, and their ethnically-oriented businesses. Chinatown’s main plaza has well-restored architecture of the mid-century–a good mix of the kitschy and historic. There has been a lot of effort to preserve the historic architecture in the neighborhood, being very close to the original Spanish colonial roots of the city at Olvera Street. In the past decade, Chinatown has gentrified, drawing creative types including artists, designers and DJs. Many locals visit it for the many art studios and trendy bars, many using the rich colors and decor of the buildings’ facades. 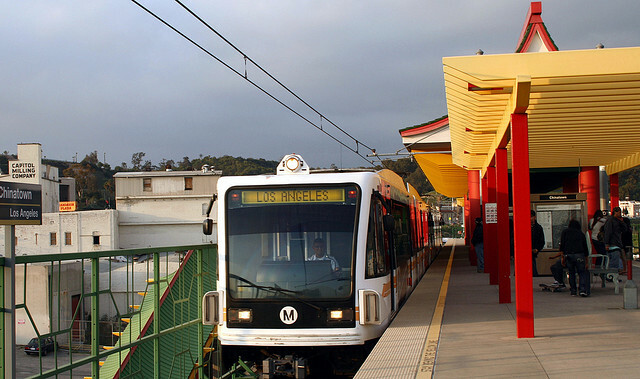 The best part of the neighborhood that Chinatown is easily accessible without a car by LA’s awesome MTA rail system, on the Gold Line just one stop north of Union Station. This is one of the original rail routes from Southern California’s fabled Red Car trolley system–in the early 1900’s, LA had the best public transit system in the United States! From Union Station you can easily visit the other art and architecture hubs of Downtown like the massive Brewery Arts complex (home to the 2x annual Brewery Arts Walk), Little Tokyo, and the Downtown LA Arts District, a former rail yard turned art and design center, home to Sci-Arc, the Southern California Institute of Architecture. So don’t miss this area when you’re there! Also, don’t believe that you need to have a car to visit Los Angeles! 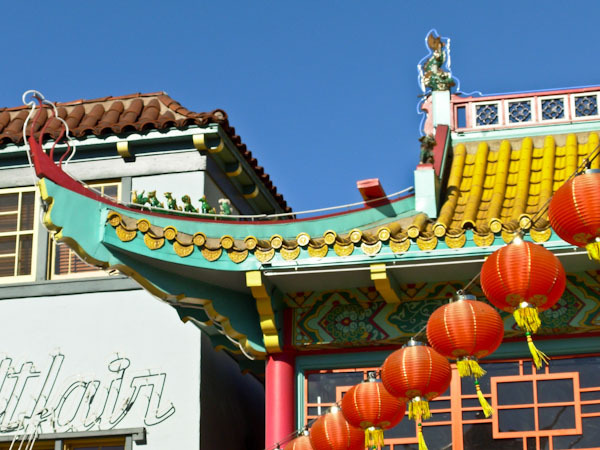 Have you been to LA’s Chinatown? And what are your favorite art and architecture sites in Los Angeles?